This year, no joke, the Hallmark Channel released a whopping 21 Christmas movies as a part of its Countdown to Christmas. While E! and Bravo tag-team as the center for all things pop culture and reality TV and the fledging ESPN is still the sports capital of cable, Hallmark thrives on holiday cheer. 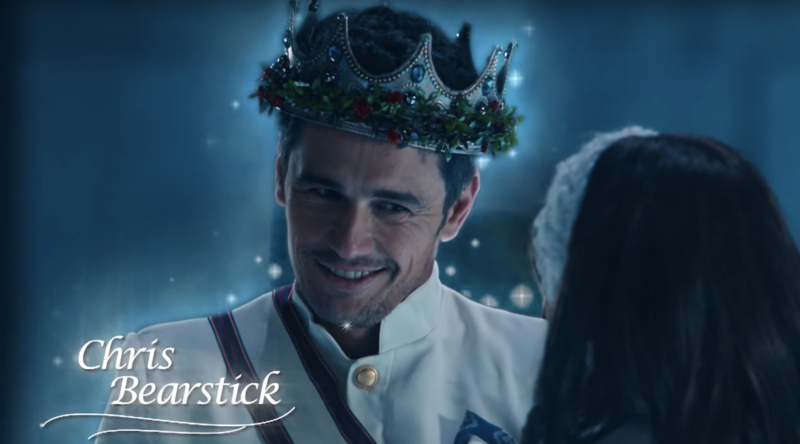 And clearly, to celebrate this record-breaking year of Christmas fun, Saturday Night Live released a cut-for-time short starring James Franco, spoofing Hallmark’s “quantity over quality” Christmas countdown. While Lifetime attempted to keep up with six new Christmas movies and Netflix opted in with A Christmas Prince and A Christmas Inheritance, nobody could quite compete with the master of vanilla Christmas films. Simply put, nobody watches Hallmark Christmas films because they’re expecting a spectacular holiday event — because none of these films will be classics, even if they do make it into the Hallmark Hall of Fame. But still, there’s an addictive quality to Hallmark movies that keep you coming back year after year, as SNL kindly points out. We seriously can’t believe the sketch got cut from the original broadcast, but better late than never! Franco stars as Chris Bearstick, a handsome Canadian actor who appears in not one but two Hallmark Christmas films. First up is Yes, Santa, in which a big-city girl moves to her hometown to run her grandmother’s Christmas tree farm and, despite having a workaholic boyfriend in the aforementioned big-city, falls in love with her high school sweetheart, who happens to be young Santa. In Prince Santa, an ice skater gets amnesia after a head injury but manages to capture the heart of a prince — who also happens to be Santa. For those not well versed in terrible made-for-TV films a la Hallmark questioning how accurate this spoof is, I promise you it captures every Hallmark film ever made. The sketch perfectly highlights the insane magic of the strict Hallmark Christmas formula: At least one recognizable actor — with the occasional appearance of a legendary actor who you can’t believe agreed to be in the film — impressively bizarre plots, two beautiful people falling in love, cozy sweaters, a miracle snow storm, and recycled sets. After watching the clip a dozen times, you’re definitely going to want to check out a Hallmark Christmas movie for yourself.